The Bambusa Balcooa bamboo is from India, it forms tangled clumps. 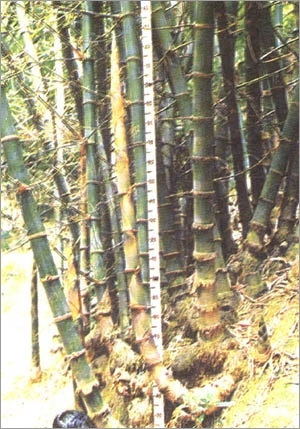 The bamboo is very strong and is used in contruction for crafts and has edible shoots- if prepared properly. Culms Reach 6 inches in diameter which are green . Tall grayish green stems 15 to 21 metres high and 75 to 175mm in diameter. Internodes are 200 to 460 mm long.